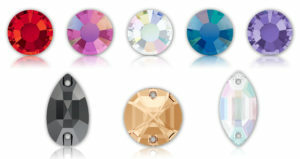 NEW COLORS available in SWAROVSKI SHIMMER! 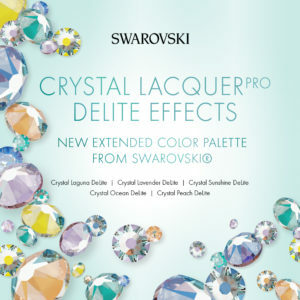 The new Swarvoski Lacquer Pro Crystal DeLite color palette offers dimension and brilliance. The casualization of luxury is perfectly captured in the blending and blurring of the iridescent hues in this stunning color range. This radiant crystal collection crosses the divide between the extraordinary and the everyday – Perfect for integrating into costumes and apparel in all genres of dance! 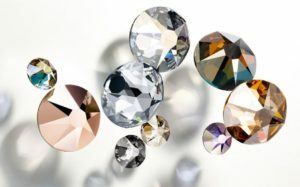 We have recently learned that Swarovski will be implementing a price increase for 2019. This means that ALL Swarovski Crystal components will be going up approximately 2% effective February 1st, 2019. 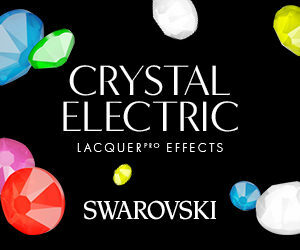 This includes all products offered by Swarovski. Rhinestones, Hot Fix Rhinestones, Sew On stones, Beads, etc. This approximate 2% increase will be for most product categories, there may be some select categories where pricing may change more. Our private label of crystals, Silver Lining Rhinestones, are also going up approximately 2% effective February 1st,2019. This includes all rhinestones, sew on stones and hot fix rhinestones. Therefore, we encourage you to place order ASAP for any items you know you will be needing for that you use on a regular basis. All orders placed with Rhinestone Supply on or before 3pm (EST) on January 31, 2019 and available for immediate delivery (in stock items) will still be invoiced at the current price. Any orders received after this time will be re-priced to include the additional 2% price increase. Additionally, any items that are not available for immediate delivery at 3pm (EST) on January 31, 2019, will be back ordered and re-priced to reflect the additional 2% (or more) price increase. Any special orders should be placed prior to Jan. 15, 2019. If you have any questions, please call our office 260-484-2711 or send an email to Sales@RhinestoneSupply.com. We appreciate your business! As a Swarovski Authorized Reseller, we are dedicated to providing you with not only the highest quality products, but also the most timely information on Swarovski products. We will continue to keep you informed of any updates we receive from Swarovski regarding the price increase or any currency adjustments. We are thrilled to present the new Electric Lacquer Pro Family ~ NEONS! The new Swarovski Crystal Electric Lacquer Pro NEON colors bring powerful neon colors to the Swarovski crystal collection. Now available are 6 Electric Lacquer colors in rhinestones with intense hues for eye catching, pop colors. This new Electric color family specifically meets the high demand for neon crystals needed on the dance segment, allowing for an intense light return on dance floor, the stage and for competitions. These new Electric Lacquer colors include UV pigments that lead to increased glow under artificial light, and will glow under black light. Available in sizes 16ss, 20ss and 30ss only. 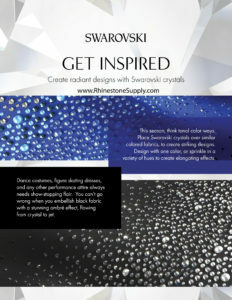 Create radiant ombre designs with Swarovski Crystals! Here’s our suggestions and quick links for a BLACK ombre and a BLUE ombre! Place Swarovski Crystals over similar colored fabrics to create striking designs! 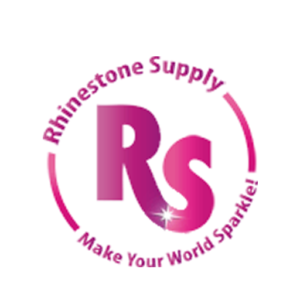 Rhinestone Supply is proud to be your Authorized Swarovski Reseller! Here’s a link to a PDF with the colors for future reference! 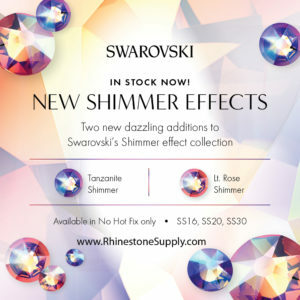 We are so excited to present the newest colors being offered in Swarovski’s popular SHIMMER effect! Welcome Tanzanite Shimmer and Light Rose Shimmer! A much needed new shade of purple with extra sparkle from the Shimmer coating is taking the figure skating and dance industry by storm! The Light Rose Shimmer provides a softer shade in the pink family! NEW! 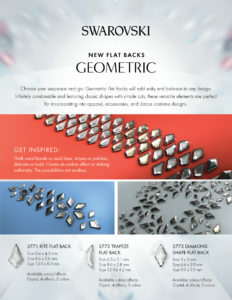 Swarovski GEOMETRIC Flat Back Rhinestones are here and open up an infinite number of possibilities for amazing designs! We are adding more styles, sizes, color and shapes every week! If you don’t see the one you’re looking for just send us an email! Sales@RhinestoneSupply.com We can tell you when they will arrive or special order the rhinestones for you! We will be closed for the Christmas and New Years holidays beginning Saturday, Dec. 23rd 2017 thru January 2nd 2018. Our ecommerce site will remain open to take orders but these will not being shipping until after Jan. 3rd, 2018. Orders must be placed prior to midnight on Dec. 21st in order to ship out prior to closing. 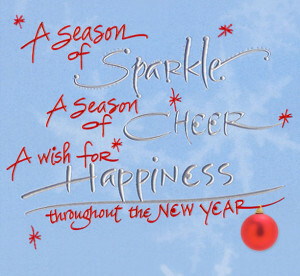 We appreciate your business and hope you enjoy your holidays with your family as we will be doing the same. We wish you a safe and happy holiday season to you and yours! 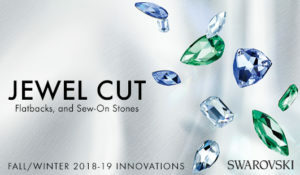 We are excited to announce the new Swarovski Fall/Winter 2018-2019 Crystal Innovations items have arrived! The additional of several new colors and shapes in the FANCY JEWEL CUT Flatbacks is most exciting! We will be adding more colors and sizes as they arrive from Austria! 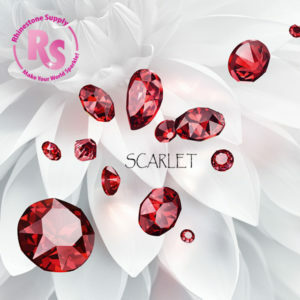 The new color SCARLET has arrived and we are in LOVE! This is like a mix of Ruby and Light Siam and provides a whole new depth to the shade of red rhinestones! We have all sizes in stock now! NEW! Silver Lining Rhinestones – Made in Austria! Our new Silver Lining Rhinestones are receiving rave reviews from our customers! SILVER LINING Austrian Crystals is a new brand of rhinestones that is both affordable and luxurious! 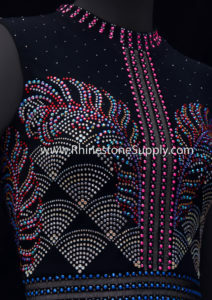 Perfect for dancesport,skating wear and other textile industries, SILVER LINING Austrian Crystal rhinestones offer the ultimate sparkle at affordable prices! Our new crystals are available in a large range of colors and sizes. They are lead free, containing .009% lead or less. Rhinestones are available with high quality foiling or in HOT FIX with an additional heat activated glue applied. The sew on stones are offered in three popular shapes. Ever wanted to know how the pro’s bead a Brad Griffies skating dress and other things? Watch this new video from Brad of Brad Griffies Skating Wear and Nicole from www.RhinestoneSupply.com on YouTube! Product instructions, different tips and suggestions! Brad also introduces a brand new product – our Bling Box! Featuring Swarvoski Crystal rhinestones, glues and tools – available to match the color of dress you purchase!